Update 2018: Getting a virtual PBX system for your small business can save you money and make it easier for you and your team to serve customs and make sales. And it’s an especially affordable way for startup businesses to sound more professional and stay connected. A virtual PBX service like UniTel Voice has all the same features as an expensive business PBX telephone system minus the hassle of having to set up and maintain traditional PBX phone equipment. That means no phone closet full of complex hardware. And because virtual PBX systems are cloud-based (i.e., hosted online) there’s no software download or update. There are lots of different types of virtual PBX telephone systems. You need to do your research so you can conduct the best virtual phone system comparison, comparing features, price, and customer support. 1. What is a virtual PBX system? A virtual PBX system is a hosted business telephone system. It allows small businesses to sound professional and stay connected. There’s no software to download or hardware to set up – you manage everything online. In other words, it’s cloud-based. 2. 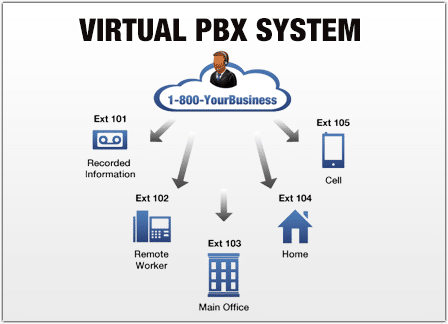 How does a virtual PBX system work? Unlike traditional PBX phone services a virtual PBX system works with your existing telephones. When a customer calls your main number, the caller is greeted by a professional auto-receptionist and then routed to the proper extension or virtual voicemail. You can literally run your business from your cell phone and sound as if you have a Fortune 500 company phone system. 3. What are the features of a hosted PBX system? A hosted PBX system or cloud-based PBX phone system provides small business with professional telephone system features such as a virtual auto attendant, call forwarding to multiple extensions, voicemail, call forwarding, caller, internet faxing, conference calling, and so much more. It’s like having a complete business phone system without the cost or equipment hassle. 4. Are virtual phone systems easy to set up? They are with UniTel Voice. After you sign up for service our system walks you through how to set up your greetings, call forwarding, extensions, voicemail, fax etc. It virtually sets itself up in minutes. However, if you need some help we have a help desk with videos, FAQs and help guides or you can simple call us and speak to a human. In fact, if you want to set up a free consultation with one of our account managers you may do so at any time. During the consultation your personal account manager will answer your questions and set up your phone system for you to make sure you are up and running as quickly as possible. 5. Why is UniTel Voice the best virtual PBX system? Here’s a few reasons: Low-cost. High quality. Loads of features. Well designed. Easy-to-use. Free USA-based support. 30-day risk-free trial. No long term contracts. Free professional voice recordings on any plan.